Mumbai,September 8th, 2017: Mukti Bhawan is not a film about achieving salvation, it’s about the celebration of death! The narrative was emphasized upon at the masterclass held at Whistling Woods International (WWI). The unique and rather dark subject death ,has been brought to light in a relatively unusual way. How people who are certain about their readiness to embark upon the journey to the other side, choose to attain moksha by going into seclusion for 15 days, is what the movie depicts. 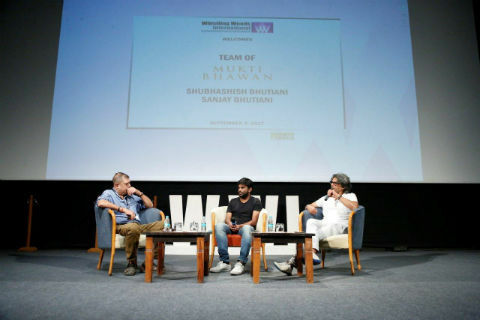 The acclaimed father son duo, the young and energetic Shubhashish Bhutiani and the ace Ad-man Sanjay Bhutiani, shared the thought process behind the making of this film. The discussion varied on different aspects of filmmaking like the unconventional subject of the film, unorthodox way of presentation, uniquely different cinematography and numerous innovative ideas.